Movistar is a brand of the Spanish telecommunications company Telefónica. This mobile operator occupies the second place in the market in terms of the number of subscribers' base and its GSM coverage is considered the widest. Since large volumes of voice traffic pass through this mobile service provider, it makes sense to use its start plans for operations in the field of VoIP termination. Movistar SIM cards (or "chips") are sold in many retail outlets around the country, including kiosks. The cost per piece is from $0.5 to $1.3. Prepaid subscribers can use the bonus offer Multiplicate. Topping up your account with $0.26, $0.5, $1.3 with this offer you get a threefold increase of your balance. Also, prepaid customers can use the offer called Plan Prepago Turista. It is represented by 2 tariff plans - for 1 week and for 1 month. In the first case, the subscriber receives 60 minutes for calls in Argentina for $2.86, in the second case - 100 minutes for calls for $7.8. 100 min. Provides 100 minutes for calls, the cost is $ 1.3. Validity term of this plan is 7 days. Ilimitados 7 dias. Provides unlimited calls inside the Movistar network, the cost is $1.3. Validity term of this call plan is 7 days. Ilimitados 3 dias. 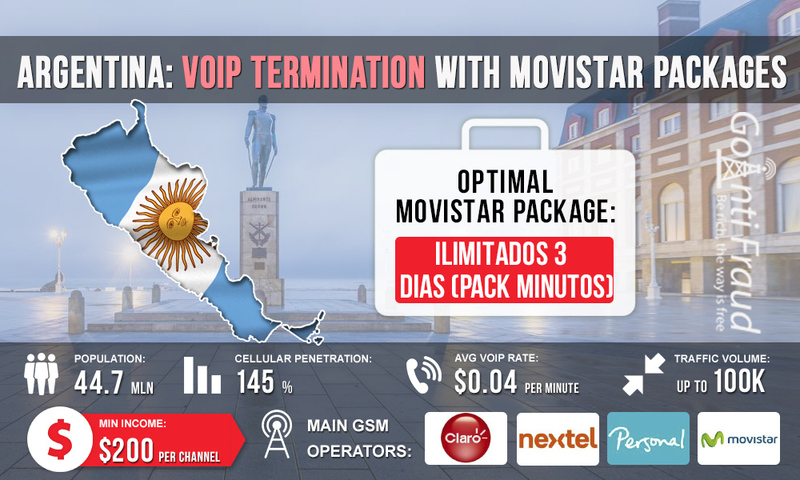 Provides unlimited calls inside the Movistar network, the cost is $0.78. Validity term of the plan is 3 days. The best choice for voice termination will be the Ilimitados 3 dias plan. With this plan, a minute of call will cost about $0.002 (if voip gsm gateway tg100 equipment operates for 5 hours a day). Thus, the terminator’s income will be at least $200 (from one gateway port).